Was Niebuhr a "Real" Theologian? Reinhold Niebuhr's daughter, Elizabeth Sifton, chuckles at the old quip that has circulated for decades in Protestant circles: Though the Reinhold was more famous and prolific, his younger brother, Helmut Richard, was really the superior theologian. Of course, remarks Sifton (author of a book on her father's "Serenity Prayer"): That has been an inside joke within the Niebuhr clan all along. 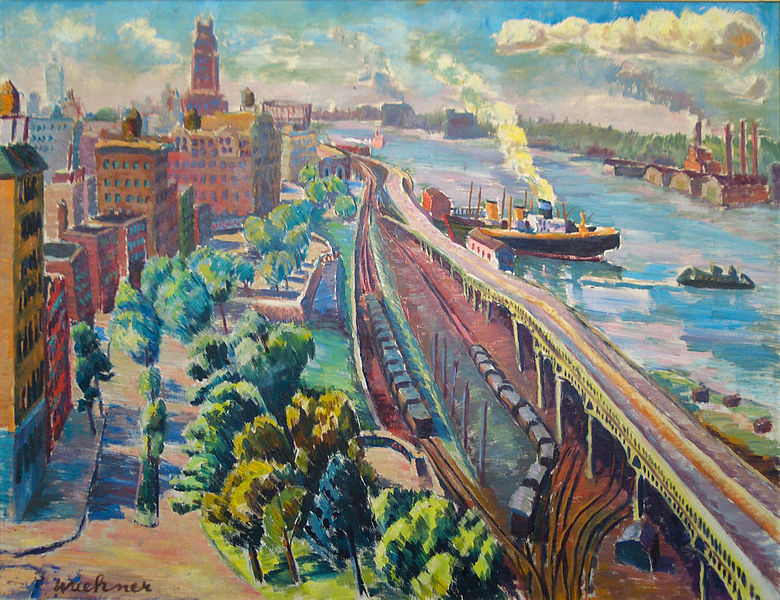 A painting of Riverside Drive and Riverside Park at about 145th Street. What are we to make of Reinhold Niebuhr -- political activist and theorist, preacher, ethicist, and public theologian? Like the "Christmas" that is "in the air" in an interminably replayed holiday cult classic, Niebuhr's name has been in the air for the past several years -- bolstered in part by an ostensible rebirth of political "realism" in the Obama administration and by references to the great German-American thinker in newspaper columns. And just in time for these heady post-Camelot days, when a "reality" TV producer and casino developer has usurped the high priesthood of U.S. power, Niebuhr gets another shout out in a new documentary by Martin Doblmeier, set to air on PBS affiliates this spring. An American Conscience: The Reinhold Niebuhr Story. A film by Martin Doblmeier. (Journey Films, 2017). The film is quite good -- every bit as taught and gripping as Doblmeier's earlier work on Bonhoeffer -- and I highly commend it. Doblmeier did his research. The cast of consultants interviewed is extraordinary: Niebuhr Society President Healen Gaston. along with Niebuhr experts Ronald Stone and Robin Lovin; scholars with relevant cognate expertise for situating Niebuhr's work -- Andrew Bacevich, Andrew Finstuen, and Mark Massa; the firebrand public intellectual; the cool-headed New York Times curmudgeon, David Brooks; and Dorrien, who graced the audience with some punchy commentary in the post-screening Q&A. Civil rights icon Andrew Young, also featured in the film, attests to how carefully civil rights leaders in the early 1960s were reading Niebuhr's work. Author Susannah Heschel, daughter of the Abraham Joshua Heschel, offers delightful anecdotes attesting to Niebuhr's graciousness, warmth, and humor and his abiding fascination with Jewish thought. Contrarian bon mots from Stanley Hauerwas, who claims to "love" Niebuhr while disagreeing with virtually everything the man wrote, provides some welcome color, and even a bit of comic relief, to a fairly serious film bordering occasionally on hagiography. As an added treat, President Jimmy Carter, who himself has claimed (perhaps less plausibly than Mr. Obama?) Niebuhr's mantle, weighs in as well. This biopic celebrates Niebuhr's work as a pastor and seminary professor, a colleague of Paul Tillich and comrade of Dietrich Bonhoeffer and Abraham Joshua Heschel (Billy Graham, not so much). But what comes most to the fore is his vocation an activist, political philosopher, and overall voice of conscience for an U.S. electorate and political establishment often unsure and unsteady about their proper role in the world. We learn how Reinhold, the elder son of German immigrants, parlayed his early stint as a Detroit pastor into a platform for labor agitation in the face of Henry Ford's burgeoning capitalist empire; how he dabbled in socialist politics, even running for statewide office in New York, only to go more mainstream in embracing Roosevelt's New Deal; how he stridently challenged the indolence of isolationists and the naivete of ideological pacifists in the lead-up to World War II; How he was initially reluctant to get directly involved in the nascent Civil Rights movement in the late 1950s; how he served as a political adviser to the Kennedy administration; and, finally, how he became a trenchant critic of U.S. foreign policy in Southeast Asia. All this, again, raises the question: Just how theological was Niebuhr's work -- at least the main body of it? To what extent did specifically Christian theological and moral commitments shape his vocation as public intellectual? From what I've read, I'm inclined to answer the later question: "a very great deal." But the earlier question seems a little more ambiguous. To be sure, Niebuhr, who never earned a doctorate, did not write extensively, say, about the intricacies of trinitarian dogma; nor did he offer in-depth analyses of atonement theories; nor did he offer a thorough critique or defense of two-natures Christology. That said, I do have to point out that Niebuhr was a prolific and world-class preacher, who could engage biblical texts with extraordinary sensitivity and insight. In the film, Cornel West (who studied with James Cone at Union) argues that Niebuhr's Moral Man and Immoral Society remains "to this day" the most important foundational text in contemporary Christian social ethics. To be sure that book, which might well be Niebuhr's best, is a tour-de-force that remains as relevant today as it was eight decades ago. But I still wonder: What is so specifically Christian about it? To be sure, he offers a brilliant critique of the posibilities and limitations of religious idealism within the socio-political sphere, but to what extent might distinctively Christian confessional and theological commitments undergird or perhaps complicate his proposal? 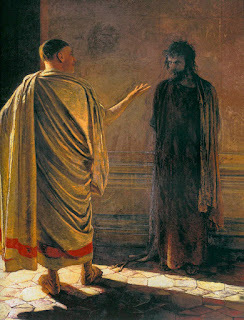 In the film, Hauerwas, the Duke theological ethicist whose portrait (like Niebuhr's) also once graced the cover of Time Magazine, raises the issue in his own pointed way: For all his brilliance, Niebuhr (Hauerwas avers) lacked a proper ecclesiology -- a thick description and normative account of Christian community. Indeed, just where does the church fit in for Niebuhr, arguably one of the great modernist reinterpreters of Augustine's City of God? For now, I leave it to the Niebuhr experts to address such questions. But I was struck by the answer Dorrien gave the audience: Niebuhr was, after all, a low church Protestant (not a high-church Anglican or United Methodist crypto-Catholic). Such folks are inclined, on principle, to keep their ecclesiologies minimal; and I think that answer resonated, by and large, with the audience, as was perhaps evident by the show of hands when they were asked how many of them had even heard of Hauerwas. I echo the concluding Jackson comment on Niebuhr...Anabaptist scholars certainly interact strongly with HR Niebuhr...Christ and Culture....in current parallel is Jim Wallis of Sojourners a real theologian...was Strngfellow....the question ends up being almost silly.